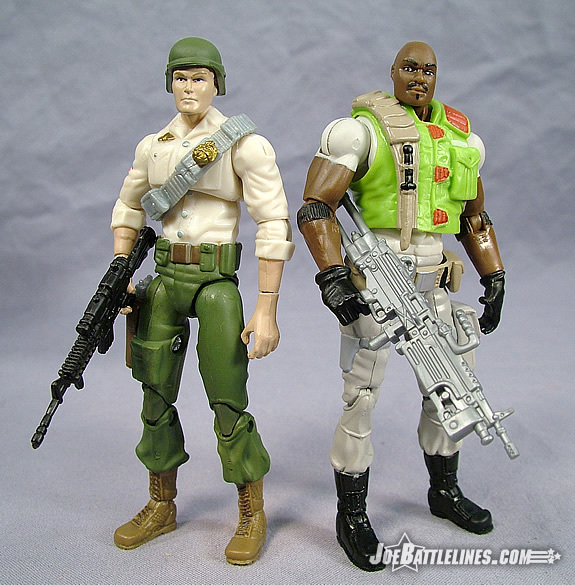 1986 was a year of transition for the GIJoe line in my eyes. It was the year the premiere obsession of my youth become more ‘science fiction’ than ‘fiction’. Gone were the familiar Cobra blue shirts and in their place came legions of Battle Android Troopers and Vipers. Characters like Gung-Ho, Breaker, Stalker, and Doc were out and Leatherneck, Dial-Tone, Beachhead, and Lifeline were in. 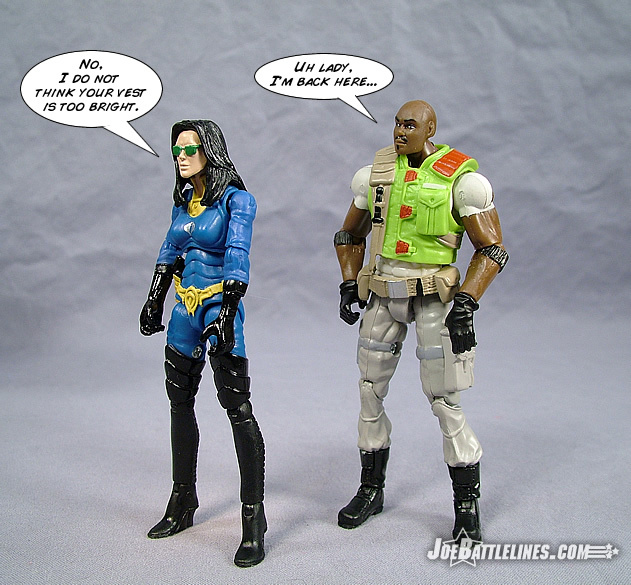 Even the mighty Cobra Commander was being phased out in favor of the newly created Serpentor. It was a time of transition in which only a few of the characters of the previous years maintained the level of exposure that they had previously enjoyed. 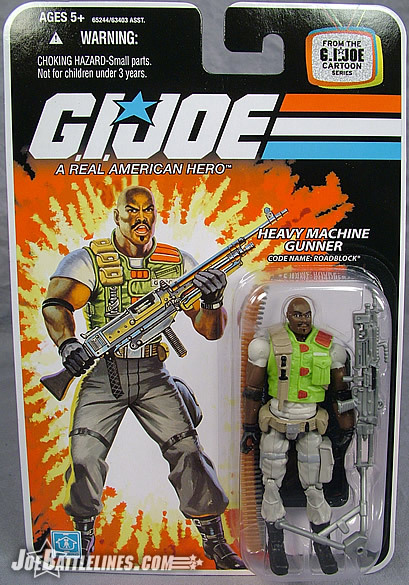 One such character was Roadblock, the gourmet-chef-turned-heavy-machine-gunner who abandoned his camouflage tank top and brown pants in favor of something a bit more “80’s”. 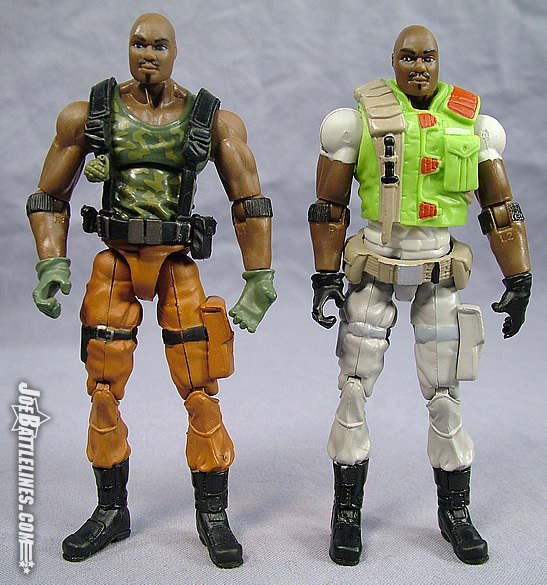 Now, nearly 22 years later, Hasbro revisits that updated character design for Roadblock in the current “no-ring” style of construction and the results are mostly positive. I’ve just gotta interject for a second here with a nod of approval. 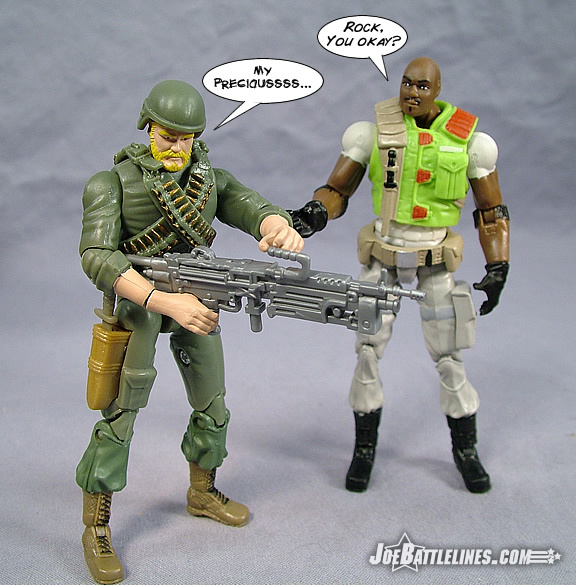 I hear so many Joe fans lather complaints about the 90’s saying how the unrealistic nature of the Battle Corps era “killed” the Joe line. I only need to point to 1986 (which also ends up being one of the fans’ favorite runs of the entire toyline) to show that G.I. Joe thrives and succeeds off of a pseudo science-fiction flair and doesn’t need to be tied to straight-up military realism. ’86 was a HUGE year for G.I. Joe and really identified what the line would be known as for the future, and I just find it interesting that so many fans love what we got in 1986, but are quick to lambaste the G.I. 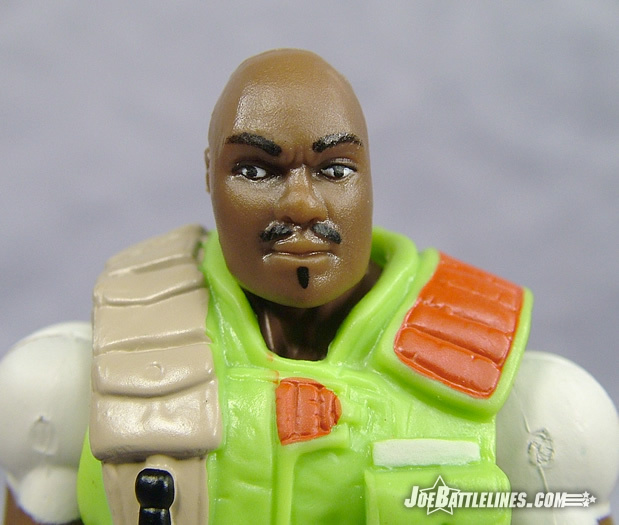 Joe of the 90’s, even though the core elements were much the same. Roadblock’s 1986 uniform update is a 180 degree departure from his original uniform. Clad now in mostly lighter hues, the heavy machine gunner is a friendlier hi-tech version of his former self--- or at least that might have been the logic back in the day. To produce this particular figure, Hasbro went back to the previous 25A version of Roadblock and gave him a brand-new color scheme as well as new a new vest and web belt. The figure’s pants are now painted light gray and the upper torso and shoulders have been painted white to simulate a fresh Hanes t-shirt. (Or is that Michael Jordon?) The dark green gloves have been reproduced this time in black plastic and a tan and silver belt now encircles the figure’s waist. The biggest change, however, is found in the replacement of Roadblock’s web harness with a bright green vest. Adorned with red claps and a quilted red shoulder, the new accessory also has a beige vertical section with a sculpted knife. Whereas the original color scheme for Roadblock was dark this updated is decidedly light—possibly presenting children of the 80’s with a much friendly version of Marvin Hinton. It’s a uniform that could only have been created in the late 80’s and, once the nostalgia has worn off, it’s a uniform that is extremely dated. Still, I’m surprised by how much I like this update to the character only because it is such a contrast to the original version. This figure will never replace the original Roadblock character design in my mind’s eye, but at least it offers enough of a contrast as to stand out. So Justin, do you have anything to add on Roadblock’s cleaner 1986 style? Eh… back in the day I did enjoy the fact that this second version of Roadblock was larger and stockier than the ’84 version has he should be. 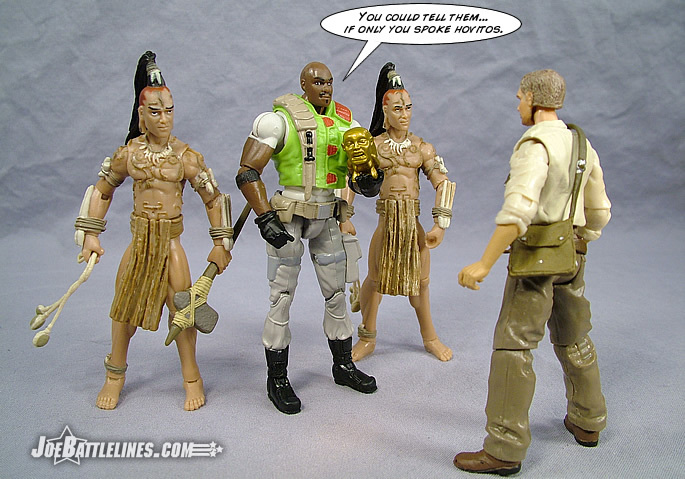 In ’85 and ’86 we got some nice enhanced sculpts with broader shoulders, larger arms, and some more intricate designs, but the strange pattern of Roadblock’s vest just never really translated for me, and I wasn’t a huge fan of it. I still am and will always be a huge fan of the Battle Corps Roadblock which isn’t reminiscent in the least of his iconic look, but to me I’m just not a big fan of the design elements of this particular version (even though Hasbro did a decent enough job translating the look for the 25 th Anniversary). 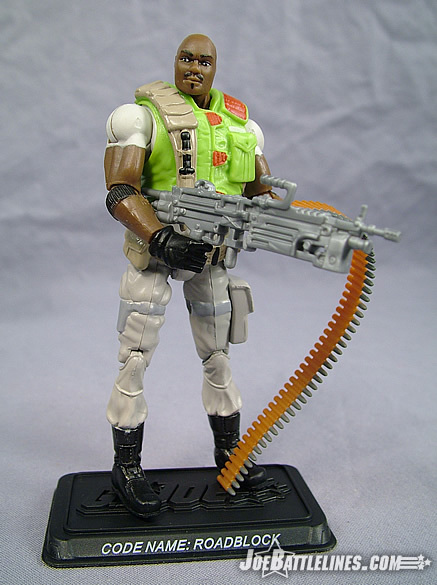 As 1986 seemed to represent an “out with the old, in with the new” house cleaning for the GIJoe roster, the same seems to hold true to Roadblock’s included gear. 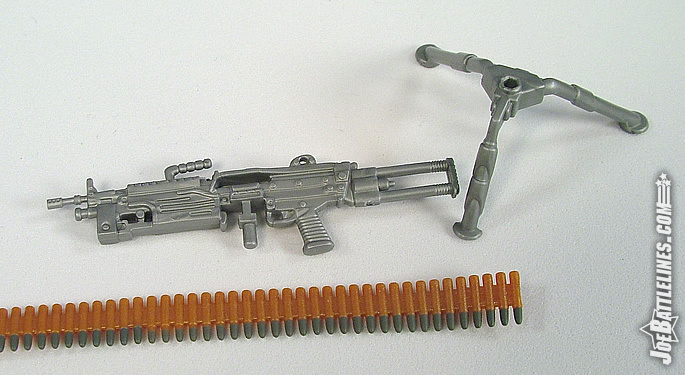 In 1986 Roadblock’s signature “Ma Deuce” was phased out in favor of a smaller silver machine gun and tripod. In the case of this anniversary figure, Specialist Hinton has picked up a silver SAW and a brand spanking-new shiny tripod to go with his bright and clean gear. The weapon fits well into Roadblock’s hands which is fortuitous considering that this figure body was designed to hold a much larger weapon. There is a slot on the side in which to secure the included ammunition belt, leaving the spare rounds to dangle to the ground. Since the figure is capable of holding the included weapon single-handed the figure’s left hand, with its wide-spread grip, can now be used to steady the belt a bit more. In keeping with the figure’s updated uniform this appears to be a more modern take on the character, at least back in 1986. All-in-all, I’m surprised by how much I actually like this figure. Yet, it’s a straight repaint with a new vest, but it’s a repaint that differs enough from the initial release that I don’t feel too much like Hasbro is just “double dipping” on the mold. (Cobra Trooper—I’m SOOO looking at you right now.) While I would have preferred a new less baby-faced head sculpt for Marvin, I’m still pretty happy with how this figure turned out. The only issue that I really have with it is the fact that no molding changes were made to the figure’s forearms to simulate the sleeves of the painted t-shirt. This is a fairly minor quibble but one that makes the figure’s arms look a bit sloppy in retrospect. All-in-all, I can find little fault with the update to Roadblock and, unlike the recent Major Bludd figure, I think that Hasbro did a pretty solid job of producing a new figure while reusing the body of an older one. I’d recommend this incarnation of the team’s rhyming heavy machine gunner to all fans of this “no-ring” style of construction and to fans of 80’s nostalgia in general. On that note, I’ll turn the keyboard over to General Hawk for his closing thoughts. There were several design decisions that left me scratching my head a bit with the original Anniversary Roadblock, even if I can appreciate why those decisions were made. From the aforementioned “babyfaced” head sculpt to the odd positions of the hands, and the somewhat scrawny legs, Roadblock just left me a bit cold in certain avenues, and this one doesn’t change much of that. I do agree with Fred that having him able to hold the machine gun belt is a nice feature, and I really do love that machine gun he comes with. His vest his translated very well to the Anniversary style, but not being a huge fan of the design to begin with I’m not all giddy about this update. Still for what it is, it works fairly well, and will fit in with collectors’ “Season Two” animated set fairly well.